Belize City was founded in the mid-17th century by British lumber jacks. Before the arrival of the British the Mayan city of Holzuz had been here. The city was located on the sea, at the mouth of several rivers and creeks used by the lumber industry. It slowly grew into what is now the economic and cultural centre of the country, with a population of about 70,000 people. It is no longer the capital, as Belmopan became the capital in 1970 after a devastating hurricane destroyed most of the city. The city is divided into two main areas. The Northside is bordered by Haulover Creek and bordered to the east by the Fort George area. The Southside extends to the outskirts of the city and the Port area, which includes downtown. Politically the city is divided into ten constituencies but most people just talk about the Northside and the Southside. Bliss Centre for the Performing Arts, Southern Foreshore, Belize City, ☎ +501 227-2110. The largest cultural centre in Belize and also hosts the National Art Collection of Belize. Image Factory, 91 North Front St, Belize City, e-mail: imagefactory70@yahoo.com. M-F 09:00-17:00, Sa 09:00-18:00, Su 10:00-17:00. An independent gallery and cultural center with changing exhibitions and a small book shop. Probably the best place in Belize to learn about contemporary local art. Free parking across the street in secure parking lot. The Museum of Belize (City centre, walking distance to water taxi terminals as well as the "Tourism Village"), ☎ +501 223-4524. A former prison and now the national museum of Belize. Old Belize, Mile 5 George Price Highway, Belize City, ☎ +501 222 4129. Old Belize is a landmark attraction, offering a total Belize experience for locals and tourists. At its heart is the Old Belize Exhibit, a stirring, large as life, cultural and historical display taking visitors back in time to various defining segments of Belize’s past, with authentic relics from key periods, a haunting introductory teaser to the Mayan legacy in Belize, an eerie depiction of the Belize City of Colonial days, an intimate glimpse into 18th century logging camps, and more. Old Belize also features the only beach in Belize City, the Old Belize Marina, a full service restaurant, plus conference facilities and banquet hall. Old Belize is located at Mile 5 on the Western Highway, a BZ$10 (Belizean dollars) cab ride from the Tourist Village, Brown Sugar Terminal, downtown Belize City, and most central locations in Belize City. Baron Bliss Day (March 9th) - Baron Bliss Day honors one of Belize’s founding fathers with a regatta in the harbor next to the lighthouse where the man is buried. Horse races, cycle races and other fun events are scheduled in Belize City along the waterfront every 9 March. Belize City has a tropical climate with generally warm to hot weather with high humidity. Temperatures usually hover around 30 °C during the day and 23 °C at night. December to April is the best time to visit because it is the dry and sunny season, while from June to November it is rainy season with occasional hurricanes possible from August onwards. A taxi to Belize City costs BZ$50.00 and takes 15 to 25 minutes depending on traffic. Although an airport bus service exists, it is very infrequent and unreliable. There is also a Shuttle Service. Another option is to walk or taxi from the airport to the Northern highway (about 2.5 kilometres) and wait for a bus. Shuttles can pick you up at the airport, your hotel or from anywhere, and transfer you much quicker to almost anywhere in the country and with much more ease since they are door to door. Most of them are based in San Ignacio Town, east of Belize City in the Cayo District and wrote about connecting San Ignacio to the airport and other places in Belize. 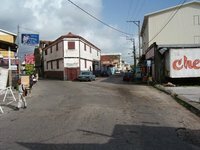 Therefore, one must ask them if they provide transportation originating in Belize City and going somewhere else if they don't plan on going to San Ignacio. Buses to/from Santa Elena/Flores in Guatemala (2-3 hrs) arrive/depart at the San Pedro Express water taxi terminal at 111 N Front St while the ADO bus to Mexico are at the Novelo's bus terminal. Bus travel is a very common mode of transportation in Belize for going to work, shopping and other errands. Therefore, bus service along the main highways is frequent, usually hourly and sometimes half-hourly during peak travel times. For service to/from small rural towns off the main highway they can be less frequent to as little as 4 or 2x daily and no service on Sundays. Like the famous chicken buses in Guatemala, they operate in the recycled U.S. school buses, but they can also be in the older MCI (Motor Coach Industries) buses (intercity buses used by Greyhound and other companies in the U.S., usually for "express" services). They are usually not crowded, but they can be too. The services provided are either "regular" which means they stop anywhere along the road to pick up and let off passengers and "express" with only scheduled stops in major towns. Northern Zone (Belize City - Orange Walk - Corozal) Some continue north to Chetumal in Mexico from Orange Walk while others may deviate east or west from the Philip Goldson (Northern) Highway (main road) to other surrounding towns. They are: Albion’s, Belize Bus Owners Cooperative (BBOC), Cabrera’s, Chell’s, Frazer, Joshua’s, Morales, Tillett’s, T-Line and Valencia. Northbound buses depart from Belize City about every half hour from 05:30 to 19:30. Jex and Sons Bus provides bus service between Belize City and Crooked Tree. Western Zone (Belize City - Belmopan - San Ignacio - Benque Viejo Del Carmen) They are: BBOC, D and E, Guerra’s Bus Service, Middleton’s, Shaw Bus Service and Westline. Westbound buses depart from Belize City between 05:00 and 21:00. Some may continue west from San Ignacio to the Guatemalan border at Melchor del Mencos but they do NOT cross into Guatemala. Others may continue north or south from Belmopan, San Ignacio, etc to reach other towns not on the Western Highway. 8 Ocean Ferry Belize, 50 N Front St (Along Front Street at the northeast end of the Swing Bridge), ☎ +501 223-0033, +501 233-0033, +501 223-2033. Connects Belize City to Caye Chapel, Caye Caulker and San Pedro. San Pedro Express (http://www.belizewatertaxi.com), 111 N Front St (behind a marketplace located 250 m east along Front St from the Swing Bridge & the Ocean Ferry Belize Terminal. ), ☎ +501 223-2225. Connects Belize City to Caye Caulker and San Pedro Town. They have a once daily connection from Caye Caulker and from San Pedro to Chetumal. Marva's: a small family-run restaurant serving good, hot breakfast within walking distance from the water taxi terminal. Riverside Tavern, 2 Mapp St (Mapp St & N Front). Tu-Su, 11:00-24:00. Owned by Belize's only brewery you can get the freshest and coldest draft beer. Also great hamburgers, and other food available. Three Sisters Guesthouse, Queen Street, near majestic alley cross, ☎ +501 203-5729. Check-out: 11:00. Held by a lovely Salvadorian woman. Three narrow rooms with private bathroom, wifi, no a/c. Large (somehow empty) common space. Noisy during daytime, ok at night. Sea Breeze guest house, Gabourel Lane. Central but quiet location. Dbl with fan: BZ$60, with a/c: BZ$80. SeaSide Guesthouse, 3 Prince St (From main bus station, head south on Cemetery Rd until Albert St, go right on Albert St until Prince St, then left on Prince till the seawall ends), ☎ +501 227-8339, fax: +501 227-1689, e-mail: seasidebelize@gmail.com. Basic rooms but centrally located and probably one of the cheapest options in Belize City. If you are lucky, you might get a free public Wi-Fi from the terrace. Dorm from BZ$30. Orchid Garden Eco-Village, ☎ +501 225-6991, e-mail: info@trybelize.com. From this tranquil, secure and beautiful home base some fourteen miles from Belize City, you just need to pack lightly to visit other interesting locations, such as Caye Caulker or San Pedro, Placencia, and San Ignacio. Heven Backpackers Hostel, 72 Albert Street, Belize City (down town). A great Backpackers hotel. dorm beds. $15 per person. Chateau Caribbean: A great place to stay. Food is great, especially the seafood soup. The service is awesome. The hotel is a large colonial style house which was at one time a hospital. The structure could use some repairs, but if you can look beyond that it is the best deal in town, especially as it offers you a great view of the seafront while sipping on the best Baileys Colada in Belize City. Seas Guesthouse: A resort on the outskirts of Belize City on the western highway named Old Belize. It is a beautiful resort with a beach named Cucumber Beach. One can learn about life in Old Belize there. Tourists are shown the chicletos and rum makers of Belize and the importance of baymen and loggers who logged the mahogany (the national tree). There is also colonial houses, a marina, and restaurants. D'nest Inn (info@dnestinn.com), 475 Cedar St, Belama Ph 2 (From the Best Western Biltmore, head towards the police station and then make a right. The D'nest Inn is located next to the soccer field and the river, right behind the far goal), ☎ +501 223-5416. This very cozy and reasonably priced B&B is half the price of the Biltmore, has large spacious rooms, with cable TV and air conditioning. There is plenty of hot water and great water pressure. Best of all, this B&B is run by the nicest couple you will meet, who will go out of their way to make your stay extra enjoyable. Breakfast is included with the price of the room and is always a home cooked meal. Hotel Mopan, 55 Regent St, ☎ +501 227-7351. Check-in: 15:00, check-out: 11:00. One block away from the Caribbean Sea, close to water taxis, restaurants and shops. Clean, comfortable, friendly, budget minded hotel. BZD100-130. University of Belize is the main university in Belize and has 4,000 undergraduate students. We have a comprehensive list of accommodation in Belize City searchable right here on Travellerspoint. You can use our map to quickly compare budget, mid-range or top of the range accommodation in Belize City and areas nearby. This is version 22. Last edited at 10:56 on Sep 25, 18 by Utrecht. 21 articles link to this page.